More than 90 days left before this project moves on to the next level (euro beat intensifies). There were a lot of people who are into a multitude of cartoons and anime but if you’re a car nut, chances are you’re into the Japanese manga/anime called the Initial D. The main character in that cartoon is Takumi Fujiwara who used his father’s Toyota AE86 Trueno hatchback to deliver tofu and of course, race in the twisted roads near Japan's Mount Akina. With his crazy antics and incredible drifting techniques, Takumi has made a name in the underground racing world, as has his white Toyota AE86 Trueno. If you’re like us who are fans of the show, you’ll pretty much appreciate this Lego set found on the Lego Ideas website. This Lego Ideas project is a 1:13 scale model of a Toyota AE86 Trueno Hatchback with retractable headlights. It’s 32 cm long, 12 cm inches wide, 10.8 cm tall, and has an 18.38-cm wheelbase. This version is molded from the early period model that was made from 1983 to 1985. Even better, the lego model has bonnet and doors that can be opened. Even the side mirrors are foldable, and the amount of work and details given to the model is astonishing. It even has an engine model to go with the car. 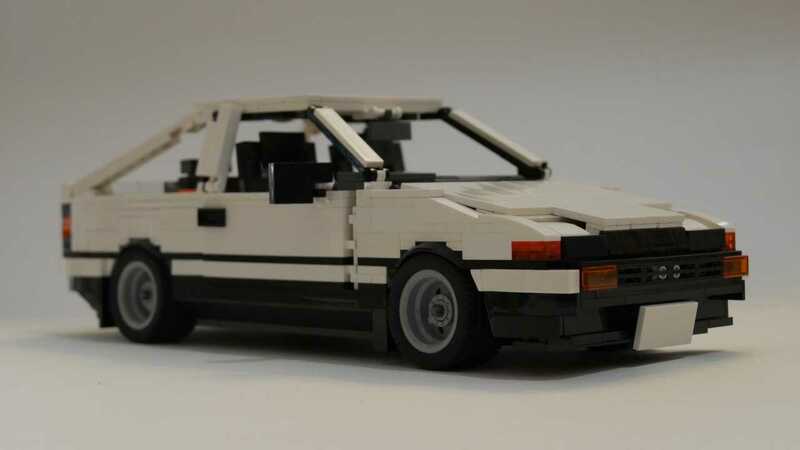 Other parts of the Lego AE86 Trueno that can be moved are the seats, which can be folded, and the trunk that reveals a spare tyre when you lift the matting. Pretty cool, right? If you like what you’re seeing here, you can support this Lego project by logging on to the Lego Ideas website and vote for the project. As of this writing, you still have 99 days to vote and the project needs 1,000 votes in order to move on to the next stage. Euro beat intensifies.